Guitar is ordered, we are going to age it down and see what happens when you throw some UV on a nitro finished US made Fender Precision Bass. Since some of our customers ask about this, I felt it was a perfect way to test out the capabilities of the lights in a real world scenario, on a popular American made bass guitar. Got guitar in, it is actually a 2005, not a 2014 as advertised, but I'm not shocked as I didn't think they made these in '14 anyway. Weighs 8 pounds 6 ounces, which seems really light. This is a good thing. I already has a lot of yellowing on the pickguard, but I think this is oxidation, not exposure. The bass has been played a lot, but is in great shape. The goal is to age the entire guitar, neck and all, so I'm building a special rig of sorts to do just this. My goal isn't to max out the aging, just do enough to change the appearance, and see how long it takes. Don't have the final photos, but it really didn't do much except dull the finish. 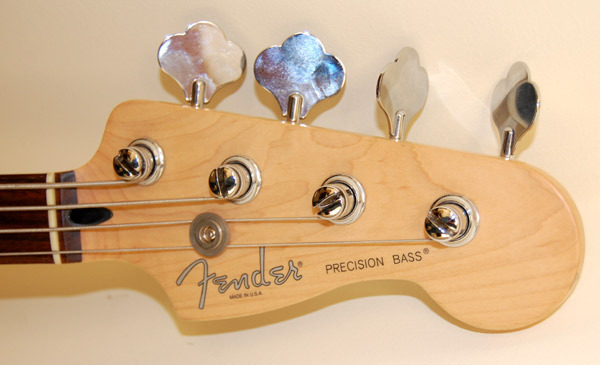 I decided against doing extensive testing once I learned that Fender actually uses a non-lacquer sealer before putting on the nitrocellulose, so really, the test wasn't going to be a decisive one anyway. As a way to age these particular guitars (ie: Fender's nitro over poly sealer) I don't think it is very effective to use any UV source. This proves that not every test comes out like you want, nor does it come out like you expect. But I feel comfortable in knowing we are honest about our testing. Next up, I will just buy a solid slab of unfinished guitar, and use ONLY nitro to do the test. This is how most craft builders do it anyway, and this will give us the answers we are looking for. What the results will be, I don't know, but we will see.